This model has been developed in the ULMA Packaging Technological Center by a combined team made of specialised engineers and researchers. The result is a machine that incorporates the state of the art packaging technology, to satisfy the most exigent requirements in the food industry. 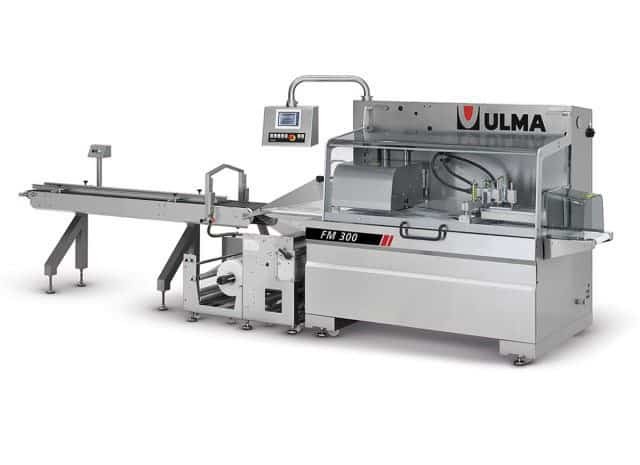 The construction made fully in stainless steel and on a cantilevered frame, its high degree of protection against moisture, together with its design made of parts that can be easily disassembled to sanitise the machine, turns the FM 300 machine into the ideal packaging machine for a very wide range of applications in the fresh food industry. Electronic machine powered by several independent motors that are synchronised and controlled by an Industrial PC based motion control system. All these features and technologies make a very flexible and highly versatile machine, and reduce product changeover time to minimum levels. The “No product – no bag” and “Misplaced product” functions are standard in this machine. Different versions are available for different films (BOPP, shrink film, barrier laminates OPA/PE or similar, …).